Cartographers are those people who often make standard maps which are accurate and which use highly exact scales. You already know about the need and use of scale and symbols in a map. You students may not essentially be able to have such command. in the modern time. There are also various technologies and methods used in drawing a map. Photographs taken by satellites from high up in the sky can be developed into required maps. 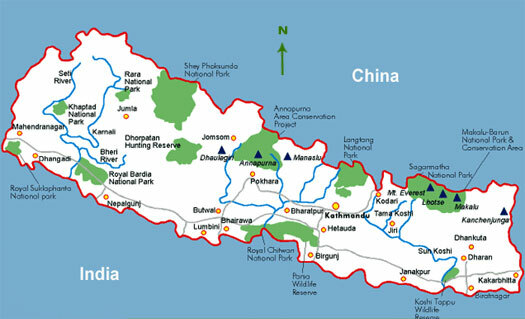 Here you learn how to draw a good outline of Nepal. Nepal has a definite location, extension, and inclination. It also has various bulges and recordings along its border. Though you cannot draw in exact scales of every portion, you must be careful about the relative size and their position. Follow the following steps to draw an outline map of your country. you can accomplish after several practices. Draw lines 2 cm away from each edge, and short dotted line in the middle. Now you have AB = 6 cm, AD = 10 cm, DG = 2 cm, AM = 2 cm, BO = 2 cm, ER = 3 cm, RG = 3 cm. Notice how these divisions mark corners of our country with Mustang jutting northwards at approximately 5 cm from each edge. The exact details of the outline are not important but you should practice drawing the outline several times, first looking at the map above, and then from memory. Add the scale. If you do the map twice as big, then 1 cm = 40 km. Now practice drawing the boundaries of the development regions. Learn the approximate position of the different towns, including where you live yourself. Cartographers are those people who often make standard maps which are accurate and which use highly exact scales. Photographs taken by satellites from high up in the sky can be developed into required maps. Who makes standard maps which are accurate and which use highly exact scales? Which of the following are considered key elements of a paper map? What does the abbreviation GPS stand for? what is prime meridian ? Any Questions on 'Cartography '?